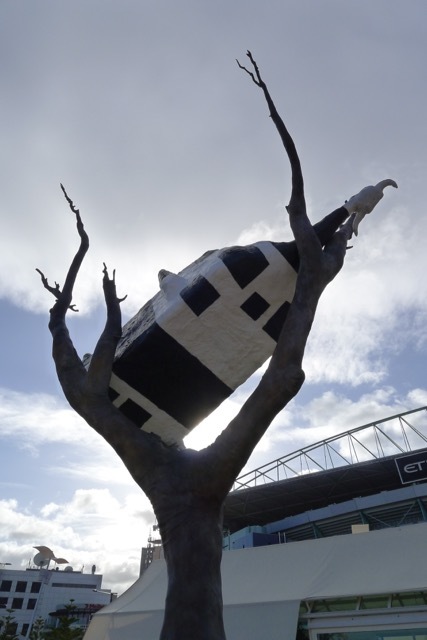 If you’re not a Melburnian, or at least familiar with the place, receiving instructions to “meet up at Docklands – Cow Up A Tree” could lead to some understandable confusion. But it’s pretty straight forward. We were to meet where there’s a cow up a tree. It was looking a bit touch and go in the lead-up to this ride. Not for the cow – it’s been stuck up there for years. Rather it was the weather forecast that was looking decidedly iffy, and it didn’t improve as the scheduled time drew closer. Given the bay-side location of our destination – Williamstown – concerns about storm surges were quite valid if the weather were to turn ugly. Thankfully the weather dawned clear and not too cold, though it was a bit breezy in places. Nothing to stop the ride going ahead, so it was off to the rendezvous point. A fine, if cool, morning – perfect for a ride. The glow of a yellow high-vis top waiting up ahead made me think we weren’t the first ones there – and indeed, we were not, but as I pulled up I realised that although the cyclists were waiting for us, they weren’t on Bromptons themselves. What’s more, there turned out to be a whole group of riders waiting for the Melbourne Brompton Club to turn up! As it turned, out riders with the Go Cycling Melbourne group had come to ride to Williamstown with us. Escorts or windbreaks? Take your pick! (as someone quipped). Either way, our group of five had just grown to 13! Six Bromptons, a mountain bike, an e-touring bike, and road bikes made up our motley crew for today’s ride. Fluro tops were trending, but on the whole our clothing was as assorted as our bikes. Once introductions had been made we were finally underway! Once we left Docklands and crossed over Railway Canal, Stephen and I were breaking new ground on this ride. It was probably a familiar route for the others. We’ve certainly seen plenty of riders take this path before, and no wonder it’s popular. The design is very good; no tangling with traffic, no being left to wait for traffic lights without a button to press to ask them to change for you. The wind was coming directly at us for most of it, but that couldn’t be helped. At least it wasn’t raining! Given the forecast, the weather was certainly cooperating very nicely! 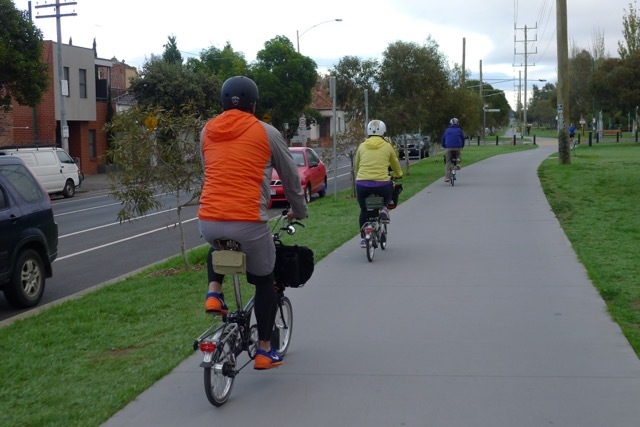 There are long stretches of flat straight road, and a few small rises, but on the whole it’s a pretty comfortably ride especially once you reach Stony Creek Reserve – from there you follow the waterfront right around to the main street of Williamstown. Williamstown didn’t seem quite as packed today as it has on previous occasions we’ve visited. (Maybe that’s because we weren’t looking for a carpark this time…) After another re-group we headed down to Gem Pier and the shelter of the HMAS Castlemaine. I have to say it made a pretty good wind-break – pity it isn’t particularly portable. I was already feeling the start of windburn on my face. By now it was definitely time to choose a cafe that could accommodate our group and enjoy a nice warn beverage. I’m not much of a coffee drinker; a hot chocolate is my preferred brew in the cooler months! Despite the heart-sinkingly long queue inside we didn’t end up waiting too long for our orders – just long enough to chat to a passer-by who stopped to ask about our bikes. They are pretty striking, especially in a group. With everyone fed and watered, we stood up to leave just in time to surrendered our places to a motorcycle group who had just parked their rides across the street. Another audience to impress with the convenience of the Brompton design, though I’m not sure we have any converts from their mob. Departing Williamstown the wind was once again in our faces and riding along the foreshore was a slog. Conditions improved as we neared Newport Park and continued into Riverside Park where there are a few more trees beside the track. Opposite the old Pumping Station behind Science Works is the Spotswood Jetty where the Westgate Punt collects passengers who wish to cross the Yarra River to Port Melbourne. Stanley, Elsie, Stephen and I bid farewell to the other riders here as we’d decided to take the shorter (and easier) route back to Docklands. Cory farewelled us from the jetty, but didn’t cross the river as it would have been the longer way home for him. In a somewhat surprising move, the punt operator offered me the wheel. I thought it was for maybe a minute or two – time enough to get a photo – but he didn’t move me on so I got to steer the punt the whole way across (it’s not that far). 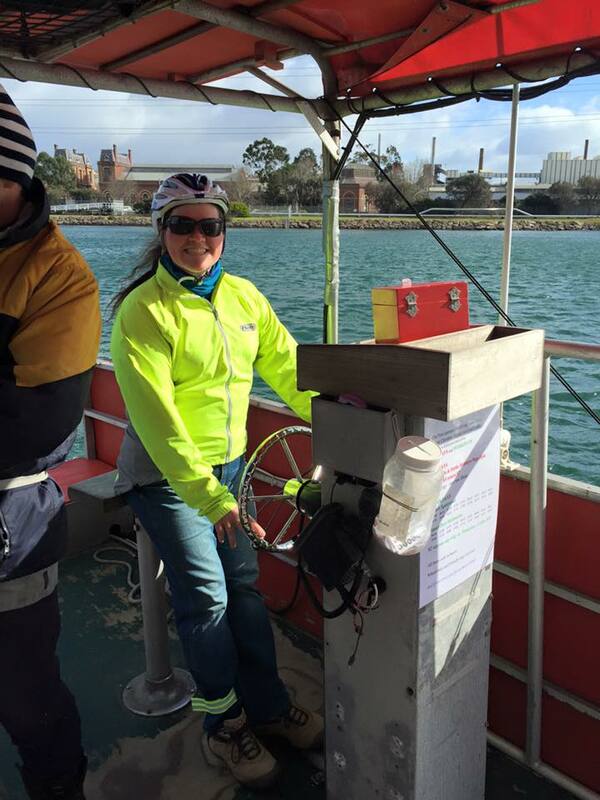 Docking was a different story – quite understandably so, though I was happy to give it a shot! 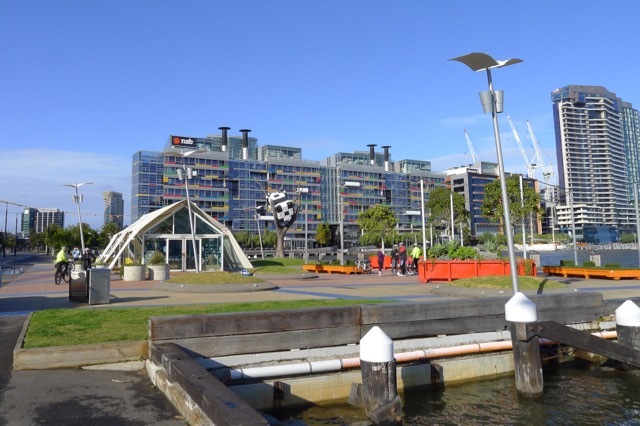 Returning to Docklands once on the other side is as easy as turning left and following Lorimer Street all the way back to Webb Bridge, though we did take the water side path in front of South Wharf Drive. The gardens along here are really quite lovely. (Thanks to a shower of rain that came through then I don’t have any photos of this section though.) 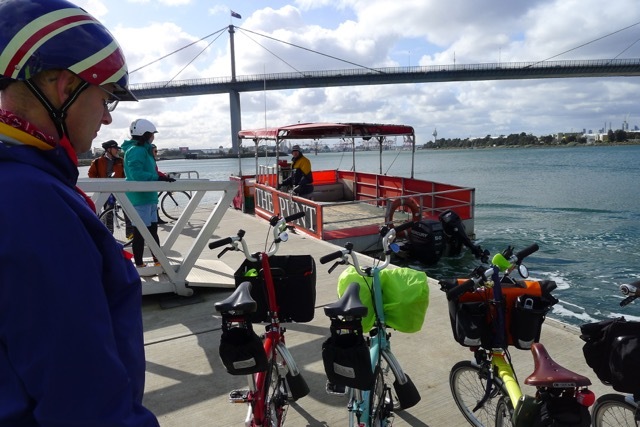 As we came off Webb Bridge and turned onto Harbour Esplanade, who should we see approaching but the Go Cycling Melbourne group who we left at Spotswood Jetty! We weren’t quite back at Cow Up A Tree, but this was where the riders truly spilt up, after a really enjoyable day’s ride – to try to beat the rain home! For more photos from this ride please take a look at Stanley’s photos or Cory’s photos (note: both are FaceBook links). 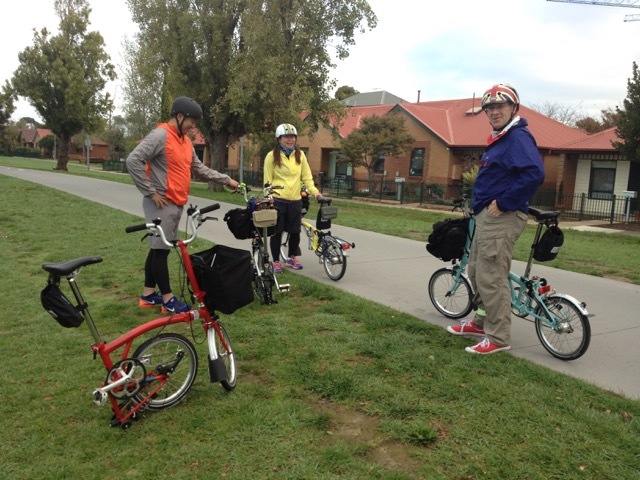 You can also check out the Melbourne Brompton Club on Flickr, again courtesy of Cory. 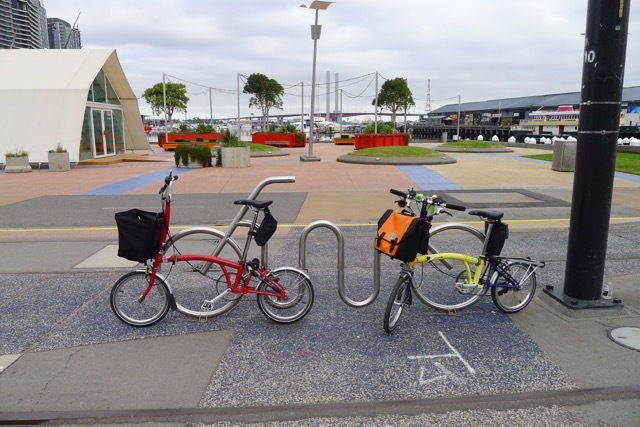 Categories: Brompton (Folding Bicycle) | Tags: Brompton, club ride, Cow Up A Tree, Docklands, group ride, HMAS Castlemaine, Melbourne, Melbourne Brompton Club, social ride, Victoria, Westgate Punt, Williamstown | Permalink. 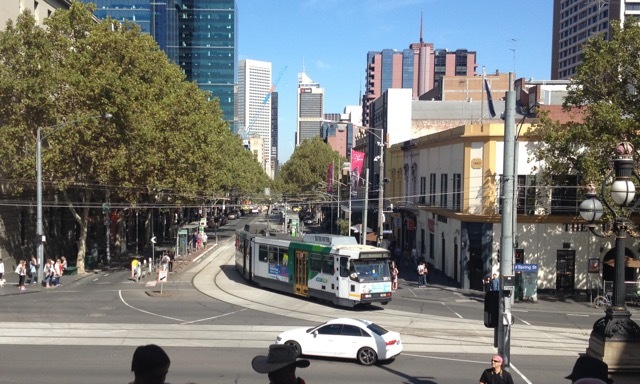 When you think of Melbourne icons, our trams must surely rank in the top 5. 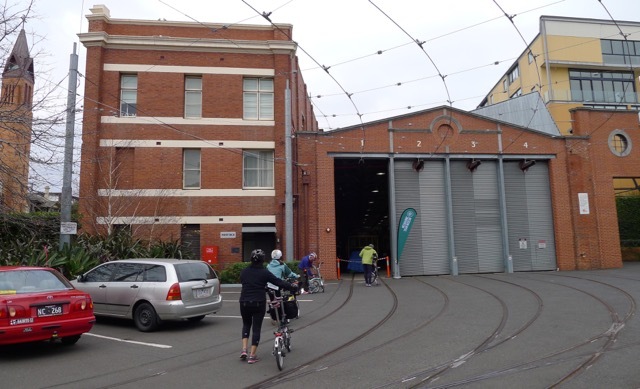 The Melbourne Tram Museum at Hawthorn is just off the Main Yarra Trail (a shared path along the Yarra River); a worthy destination for this month’s group ride. Meeting up at Federation Square we took a few snaps (because you can’t let the chance go by), before walking past the temporary ice skating rink (as instructed) then we were underway! It’s a pretty cruisey ride along the river. We followed the Yarra Trail along the north bank of the river the whole way to where Wallan Road crosses the Yarra River. Some of it is a floating walkway, but mostly it’s firm river bank. Ducking under CityLink again – almost literally along here! 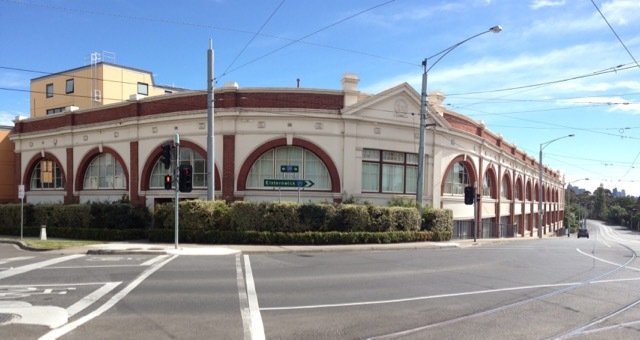 The Tram Museum is in a beautiful red and cream brick building on the corner of Wallan Road and Power Street, Hawthorn. Next year will be the celebration of its 100th birthday! The museum doesn’t occupy the whole of the premises any longer, and isn’t as large as the Hawthorn Depot was in its heyday. 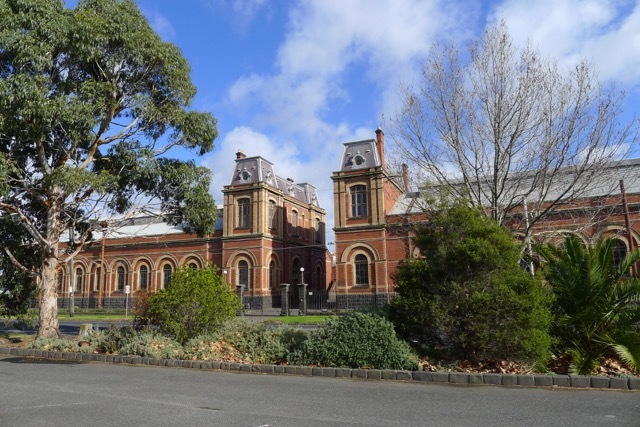 Despite now including residential units in the main building, and having a new apartment building at the back where the second shed used to be, the facade has remained as it’s protected by its listing on the Victoria Heritage Register (read more here). Totally unfazed by the arrival of a group of ‘folders’, we set our bikes and bags down while one of the volunteers gave us a bit of history about the history of the depot and a couple of the trams they have. Then we were welcome to explore and take as many photos as we wanted. The seat back can flip around so you’re always facing forwards – love it! This gorgeously extravagant tram is the work of 5 Pakastani artists and was run on Melbourne’s City Circle loop during the 2006 Commonwealth Games. A recent addition to the museum, I hope it becomes a permanent resident! “What make of bike is that?” was the first question (it’s usually a good starting point). Before long, the museum volunteer who asked had all – and more – of his questions answered by our enthusiastic group! 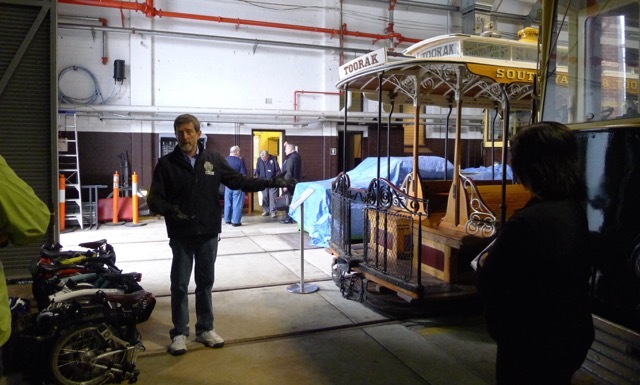 At present, the museum also has a Tramway ANZACs exhibition to honour the tramway employees who went off to fight in the Great War and the role of the tramways during that time. If you can’t visit the museum you can read more about the displays and personal stories here. 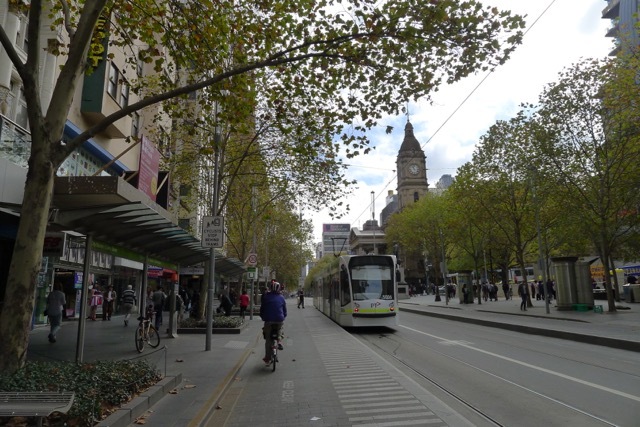 Unlike other Australian state capitals who ripped up their tram tracks years ago, Melbourne has grown its tram network over time, although we no longer run cable trams anymore. You can compare a map of the lines that were in service in 1916 here compared to today’s network managed by Yarra Trams here. The irony is that “light rail” is now being (very slowly) reintroduced to the Gold Coast and expanded in Sydney. I don’t know of any plans to expand Adelaide’s single line, but at least they kept that as a functional means of transport for commuters – if you happen to live close-by. The afternoon was getting on; we’d explored the trams, seen the ANZAC exhibition and answered Brompton questions in return, so it was time to say goodbye and head back to the city the same way we’d come. Just before leaving Stephen kindly bought each of us a badge from the gift shop to remember the trip. Elsie waiting for the rest of us to catch up! It was another enjoyable ride with the group. Next ride planned for the weekend of 26-27 July. Follow us on Facebook, Twitter or Strava to keep up to date with rides. Thanks to Stanley for letting me use a couple of his photos in this post. 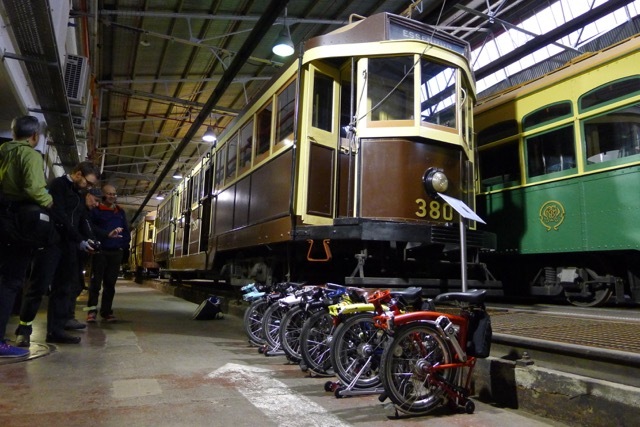 Categories: Brompton (Folding Bicycle), Victoria | Tags: Bike ride, Brompton, Cable Tram, folding bike, Melbourne Brompton Club, Melbourne Tram Museum, social ride, Yarra Trail | Permalink. The forecast had been for showers today, so I was pretty relieved when I woke up and didn’t hear the unmistakable sound of rain drumming on the roof. 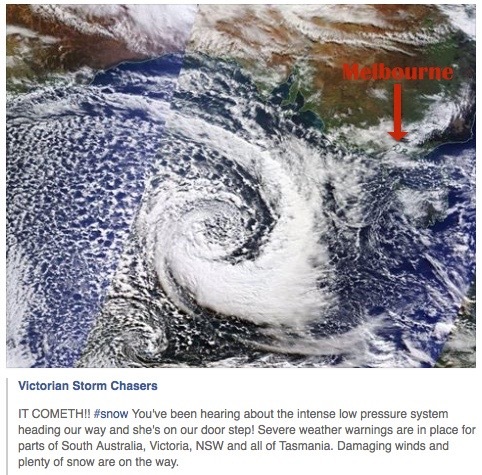 I’m not sure that everyone in our group was quite so lucky, but despite the weather (this IS Melbourne after all – if we only planed activities around ‘good’ weather forecasts nothing would happen for 8-9 months a year!) we had a pretty good turn out. So good, in fact, we doubled the number of Bromptoneers we’d had on our inaugural ride! Not bad, hey? 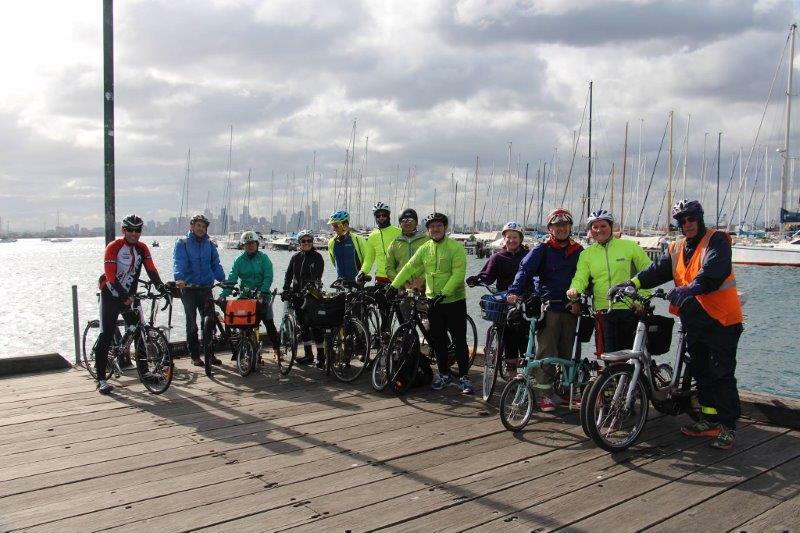 After numerous of photos were taken and all riders were present and correct, we set off to Port Melbourne. It’s only about 4km to Station Pier and once we’d picked up the bike path around the back of the Melbourne Exhibition Centre the path follows a tram (aka ‘light rail’ to most of you non-Melburnians) track all the way to Station Pier. Early on the bike path twice crosses tram tracks, and there are a couple of road crossing, but otherwise it’s a pretty cruisey ride. At Station Pier we turned left and rode the short distance along to Princes Pier. A known fishing and photography spot (some people even combine the two) it was a joy to spread out and cycle along the smooth, wide concrete jetty. I’d never been on this pier before – I’d only seen it from inside the Mini as we’re queuing the board the Spirit of Tasmania docked at Station Pier to the east. Time for more photos, surely? Not dallying too long, as a couple of our riders had limited time, we back-tracked slightly to ride by Station Pier to continue down to St Kilda Pier for a hot drink (and possibly a treat) at the Pavilion. A quick stop for photos just on the other side of Station Pier, with the Spirit of Tasmania in the background, then Cory and Greg had to depart (Greg would meet us at St Kilda Pier later). Setting off, there was even a hint of sun and blue skies as we rode along the flat cycle path along the foreshore, making the beach and Port Phillip Bay look very enticing, indeed! Plenty of folk were out enjoying the day – other cyclists, walkers, many people with dogs, some people swimming or playing sports on the sand. It’s usually a bit windy down by the bay, but we hadn’t really appreciated just how windy it was until we turned to ride out along the pier! It’s a good thing my helmet’s strapped on! I wonder what it’s like when there’s a strong wind warning for the bay? Golly! Fortunately there weren’t too many people around at the Pavilion, and we didn’t create a nuisance of ourselves as we lined up to take more photos. We even managed to grab a couple of tables and sat down to enjoy a hot beverage and chat while we waited for Greg to rejoin us. All good things come to an end, and soon enough it was time to ride back to the city. Unfortunately Greg and Siewmee said goodbye as we left St Kilda Pier, so we were down to five Bromptoneers. Heading back up the beach was all into the wind – I’m sure I’m a bit windburnt on my face from that 4km stretch. Shedding a layer (down to two) I was not disappointed to head inland and follow the more sheltered bike path by the (Route 109) tram line. The heavens opened and we were rained on as we neared the end of the line – but only gently and briefly, and just enough to prompt a couple of slightly adulterated lines of ‘singing in the rain’ from Elsie and I. Well… she started it! Back at the Exhibition Centre it was our turn to peel off from the group. Stephen and I were turning right and heading home through the city – the others (Stanley, Elsie and Bethy) were heading left to go home. So then there were three. It was another great day, and a real pleasure to have more members along on the ride. Keep in mind that you don’t have to be a Brompton owner (yet, anyway) to join us – you just need to be interested and not mind that we love our Bromptons! 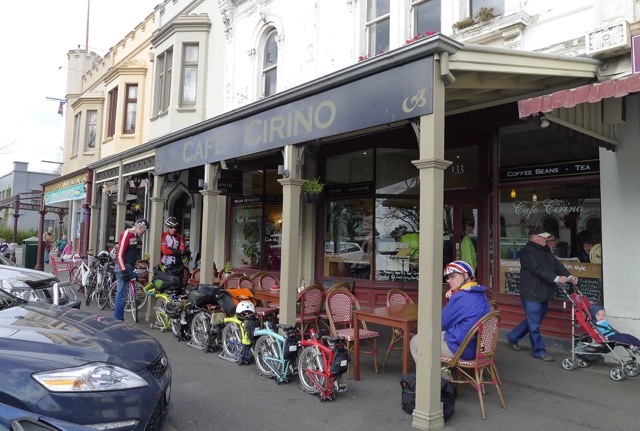 To see some REALLY good photos from this ride, have a look at Cory’s photos for the Melbourne Brompton Club on Flickr. Stanley has also posted his photos on the club’s Facebook page. The best way to keep up to date for future rides and activities is via the group’s FaceBook page, but we also have Twitter and Strava accounts. 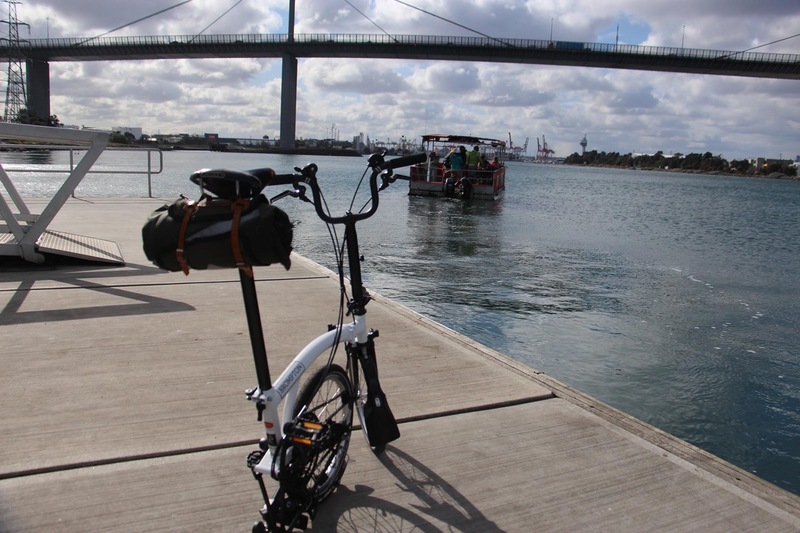 Categories: Brompton (Folding Bicycle) | Tags: Brompton, Graffiti, Melbourne Brompton Club, Port Melbourne, Princes Pier, Spirit of Tasmania, St Kilda, St Kilda Pavilion, St Kilda Pier, Station Pier | Permalink. 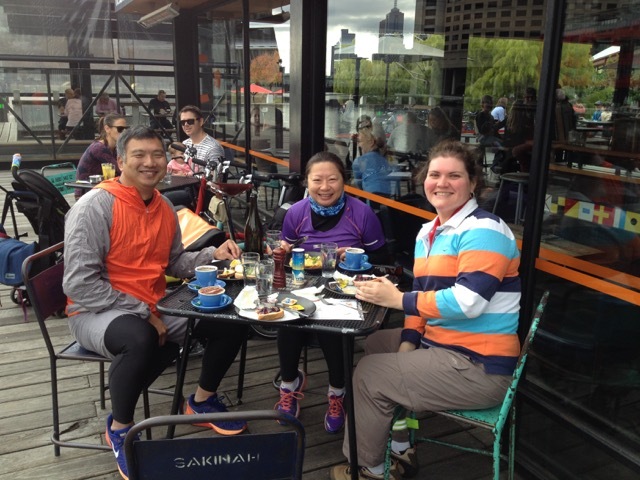 The plan was to meet at Green Park (near Velo, Carlton North) at 8am on Sunday, 3 May 2015, for a group ride into and around Melbourne/Southbank/Docklands. After an initial wince at the thought of an 8am start, I told myself it wouldn’t be any worse than a usual workday, and to grow a spine. But honestly, Stephen and I have been really looking forward to this ride, so there weren’t any grumbles when the alarm when off this morning – I even got an extra half an hour’s sleep compared to a weekday! The ride started conveniently close to where we live, so we rode to the meeting point and found Stanley and Elsie waiting for us. Meeting Stanley (left) and Elsie (centre) at the meeting point. Stephen is in blue on the right. Our ‘maybes’ for the ride didn’t turn up, so with just the four of us making up the group and the whole day pretty much at our disposal, it was decided to follow the Capital City Trail (the bike path we were on – which used to be Melbourne’s Inner Circle Railway Line) west towards Royal Park where it skirts around Melbourne Zoo. Crossing over the tracks at Royal Park Station, Capital City Trail then crosses Poplar Road within about 20 metres to continue following the railway line along to Flemington Bridge Station. A beautiful morning for a ride! Here the cycle path does a sharp zigzag and drops down to street level. Capital Trail continues along beside Railway Canal, providing views of Citylink, old bridges and wildlife that the traffic rushing overhead won’t get to enjoy. Or possibly even suspect is there. In addition to the very common Pacific Black Ducks and Australian Wood Ducks, I’m sure I saw some Chestnut Teals a pair of Black Swans, a few Great Egret’s last week, a pair of Purple Swamp Hens this week. Eurasian Coots are also fairly common. And they were just the obvious species! I’d love to take a pair of binoculars and stop around Royal Park to try to identify more of the passerines (perching birds) heard as we cycled by. 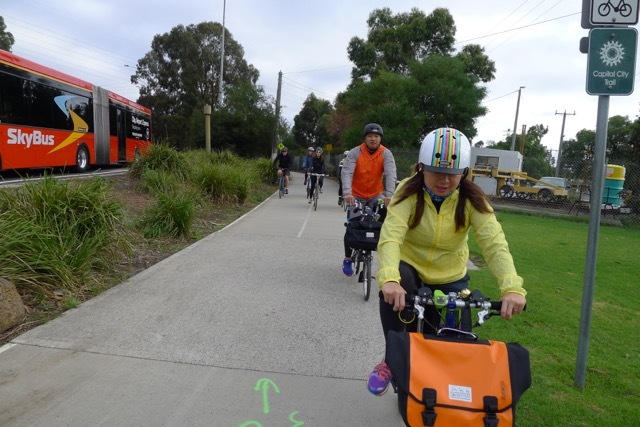 By the time we reached the intersection where Capital City Trail crosses Footscray Road we had been joined by quite a number of other cyclists. The previous weekend when Stephen and I had come this way we’d had it all to ourselves! I admit, both the rain and the fact that it was ANZAC day may have had something to do with that… Today, on the other hand, was a great day for riding. After a quick photo with the Melbourne Star Observation Wheel (still working!) we headed around to the pier. Naturally we couldn’t pass up a photo at the pier. Or with the colourful buildings and strange – or should I say, ‘artistic’ – mountain-things around us. Not much further along Elsie spotted a bike. Well, a bike-shaped bike rack, to be precise, so naturally that called for another photo. I was quite enjoying this ‘see and stop’ style of riding. The guys came back to check we were ok; reassured all was fine (our respective partners understand and have learnt to cope with our frequent stopping for a photo habits, it would seem) we set off again. A bike-shaped bike rack. Neat! Leaving Docklands, we used the lovely Jim Stynes Bridge to connect with the distinctive Seafarers Bridge, where we crossed the Yarra River. Thoughtful, elegant, practical, stylish… and the bridge is ok too! Although Stephen and I had eaten a light breakfast before setting off this morning, it turned out that Stanley and Elsie hadn’t eaten at all, so we stopped at The Boatbuilders Yard, right next to the Polly Woodside for breakfast. It seems to be a popular stop for cyclists and pedestrians. I was pretty happy with my toast; finally – somewhere that gives you sweet and savoury spreads! Making our way up Southbank after breakfast was fun. There weren’t crowds of people (yet) so even though we were riding at a considerately slow pace, we could enjoy the plane trees, whose leaves are turning colour and falling at the moment, the artworks and easy ride along the smooth dark pavers. We crossed the Yarra River again at Sandridge Bridge, continued under Princes Bridge (St Kilda Road), then road back up to the main street level using Princes Walk, after briefly stopping to greet some quite large, but very lovely, fluffy dogs (a Malamute and an Akita) and their owner. This close to Flinders Station, it would have been ridiculous to pass up the opportunity to stop for a photo beneath the clocks at the main entrance. Lucky it wasn’t peak hour – it was hard enough getting a clear shot as it was! From here we were more or less on the homeward leg… with a small diversion to the Queen Victoria Markets. Setting off along Swanson Street, I was incredibly thankful for the bike lane. City riding is tricky enough at the best of times, what with trams, horse and carriages (for tourists), and – worst of all – pedestrians! But we made it through; all intact and without incident, only to be laughed at – laughed at!! 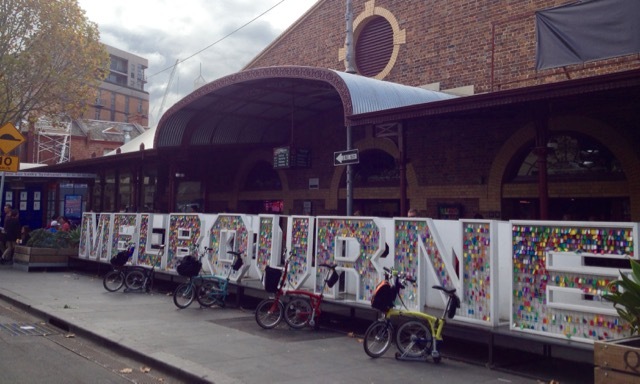 – by some bloke at the QV Markets when he saw me and my Brompton! That’s not the usual reaction I’ve had to-date, and my first thought was ‘Wait until you see there are three more following me!’ but he reportedly laughed at the sight of the rest of them, too! I’m not sure what he found so mirthful. Maybe we took him by surprise? Maybe he was delighted? I have to agree with Elsie, though – he did seem to be a bear-ish kind of a bloke. Laughing bear-like men aside, we’d reached the donut van. Stanley and Elsie declined, but Stephen and I treated ourselves to a bag (shared) of piping hot, jam donuts. Oooh what a treat! 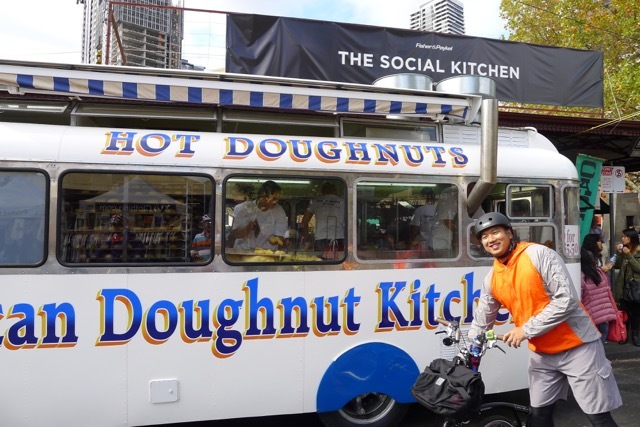 The MELBOURNE sign is very near the donut van, in the middle of the market. It would have been nice to have a fifth Brompton along for ideal spacing, but… maybe next time. Stanley’s shared a great panoramic photo of the bike from today on the club’s Facebook page. 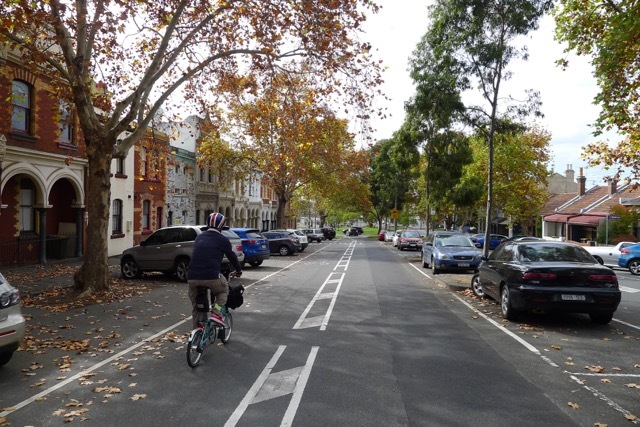 Leaving the market, we rode one block up Elizabeth Street, then followed the green bike lane along Queensberry Street to the Carlton Gardens. Yep, you guessed it. Another group photo! This time in front of the Royal Exhibition Building and the Melbourne Museum. These bikes are so much more appealing than the RACV share bikes…. but I suppose there are many good reasons for that! The Carlton Gardens are one of my favourite places in Melbourne. Maybe because they’re so familiar – I walk through them each weekday and see the changes in every season. It could be that Melbourne gardens are just lovely. Riding your bike through the gardens is not allowed though, so we set off along the shared footpath on Rathdowne Street, then rode down the (slightly) steep and leafy Barkly Street to meet up with Canning Street, which would take us all the way back to Green Park and our starting point. I believe we all enjoyed today’s ride. We were out for about 4 hours, but that included a lengthy breakfast stop, numerous photo stops and a riding pace that I would describe (overall) as ‘unhurried’. Estimated distance travelled was 18km (~11 miles). I hope the success of this first ride bodes well for many future rides. 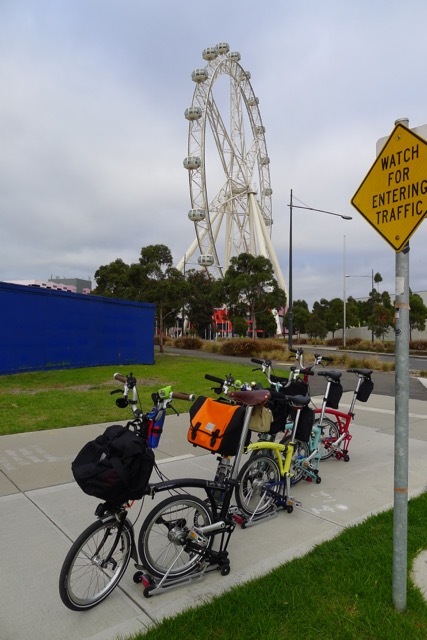 Categories: Brompton (Folding Bicycle), Uncategorized | Tags: bicycles, Bike ride, Bromptons, Capital City Trail, folding bike, group ride, Melbourne, Melbourne Brompton Club, social bike ride | Permalink.